The death toll (死亡人數) from Nepal’s (尼泊爾的) worst earthquake in 80 years rose to about 3,800 yesterday, with 6,500 injured, as rescuers struggled to reach remote hill villages while Kathmandu’s small airport was overwhelmed by flights carrying relief supplies (救援物資). Nepalese media said rescue teams had failed to reach (不能/未抵達) some villages in northern Gorkha, near the earthquake’s epicenter (震中心), by yesterday afternoon, more than 48 hours after the 7.8 magnitude earthquake (7.8級地震) struck on Saturday. Overnight rain and fresh landslides (山崩) had further hindered rescue attempts (妨礙了人們的救援努力). More than 900 of the deaths have occurred in or near Kathmandu, according to police, who are waiting for earthmoving equipment (挖掘設備) to arrive so they can begin digging in the rubble (挖開瓦礫) in the hope of finding more survivors (倖存者). Thousands have been injured across Nepal, and the UN Development Programme estimates more than 40 per cent of the country’s land mass (土地) has been affected. 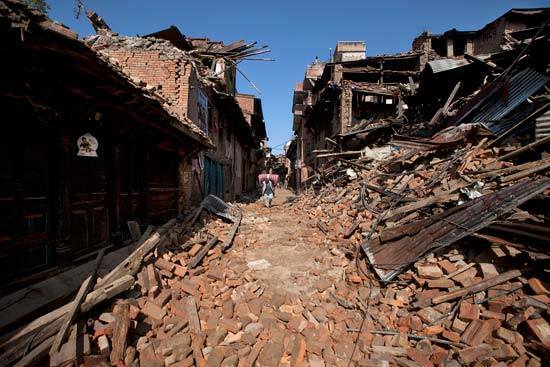 About 6.6m of Nepal’s 28m people live in the earthquake zone (地震帶).